We’ve just released our Open Banking for Businesses Survey. Based on research among 100 global banks and over 650 businesses customers, it confirms the growing global momentum that’s now behind the move to Open Banking in the corporate segment. In fact, 90 percent of the large banks we surveyed worldwide said they plan to provide Open Banking services for their commercial clients. And they’re anticipating a significant payback: 54 percent expect Open Banking to help them grow their revenues by up to 10 percent, and another 35 percent expect a revenue uplift of up to 20 percent. 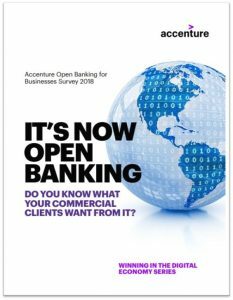 Commercial customers worldwide are also eager to adopt Open Banking. Given the benefits it delivers, this is hardly surprising. It enables companies to share their financial data securely with banks and third parties, making it possible to easily transfer funds, compare products and manage accounts using application program interfaces (APIs). But what is surprising, one year on from launch, is the current less-than-enthusiastic response to Open Banking among commercial customers in the UK. Since the UK is a world leader in Open Banking legislation, you might have expected UK corporates to be among its highest adopters globally. But you’d be wrong. In fact, they’re among the lowest. Just 27 percent of UK corporates already participate in Open Banking, well behind Sweden (53 percent), Germany (50 percent) and France (37 percent). However, despite the low adoption to date by UK commercial customers, it’s clear they’re now catching on to what Open Banking offers them. Our study finds that almost two-thirds – 63 percent – of large UK corporates plan to participate in it next year. Asked why, they point to benefits including the ability to reach more clients and partners (27 percent), gain access to convenient and innovative banking services (20 percent), and reduce complexity and implementation costs for bank connectivity. A wider look at our survey findings helps to put these figures in context. Most large banks globally said that providing Open Banking services for their commercial clients is a key strategic initiative—a status reflected in the expectation that it will deliver a big boost to revenues. However, when we asked large UK corporates whom they would prefer to partner with when joining an Open Banking ecosystem, 40 percent said they would either prefer to work with a non-bank third party or had no preference in terms of partner. And, quizzed about their degree of satisfaction with current payments and banking software, only 30 percent were fully satisfied—and another 30 percent were either interested in exploring other third-party solutions, or were dissatisfied with their current systems’ levels of flexibility and connectivity. What does all this mean for commercial banks operating in the UK? Well, while banks say that providing Open Banking services for their commercial clients is a key strategic initiative, our findings suggest that—up to now—they’ve prioritised onboarding consumers over commercial banking customers. This is a clear disconnect. What’s more, despite most UK businesses opting to partner with their bank when participating in Open Banking ecosystems, a substantial proportion still don’t see their bank as their preferred partner. With nimble fintechs now using Open Banking innovation to woo commercial customers, banks need to change these perceptions to drive significant success from Open Banking in this segment. First, move immediately to protect and retain their position with commercial customers by developing solutions around areas where there is high competition to avoid attrition. Then look to develop solutions in low competition areas to differentiate, like B2B payments acceptance. Second, over the coming year, invest and grow by exploring strategic partnerships with third-party payment provider (TPPs) to accelerate their offerings faster than if they build it themselves. Third, in 12 to 24 months’ time, diversify by tapping into ecosystems to open new revenue streams and create genuinely differentiated and smooth end-to-end experiences for their commercial customers in related areas like leasing, financial planning, payroll or pensions services. Put simply, now’s the time to swing the momentum of Open Banking into the commercial customer space. To find out more about how to do this, download our survey. The Open Banking opportunity is out there in your corporate clients. Seize it now—or risk missing out. Next Post - Rewards don’t transform customer experience. Rewarding does. Suggested Post - Rewards don’t transform customer experience. Rewarding does.